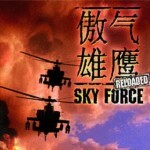 App Review: Sky Force Reloaded by Infinite Dreams Inc.
Sky Force Reloaded by Infinite Dreams Inc. is a fun vertical shooter game where you move your ship through the level and destroy enemies. When you begin, you choose your level difficulty, stage number, and your ship. There are eight stages for each difficulty. The harder the difficulty, the more aggressive your opponents are and the higher percentage of enemies you must defeat to beat the level. There are three ships to choose from. Each ship has different speed and shield strength. The first is slow with a good shield. The second is average speed/average shield. The last ship is fast with a poor shield. As the level begins, you will be given an objective percentage of enemies to kill in order to complete the level. To control your ship, touch it with your finger and move it where you would like. Your ship automatically fires. All you have to do is move your ship so that the enemies are in your fire path. 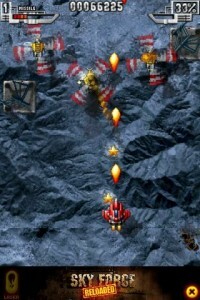 There are many different types of enemies ranging from tanks to planes. Some enemies shoot at you and others try to run into you. When you destroy an enemy, it leaves behind some stars. Collect the stars to get bonus points. 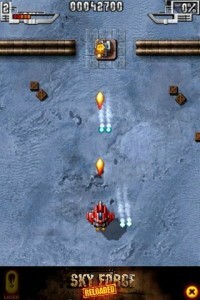 Every once in a while enemies will leave behind bonuses for double shots, lasers, missiles, or enhanced shields. Your score is displayed at the top of the screen along with the percentage you have defeated. If your enemies shoot you too many times, or run into you, you will lose one of your three lives. At the end of each round, your points are added and your score is entered into the high scores. 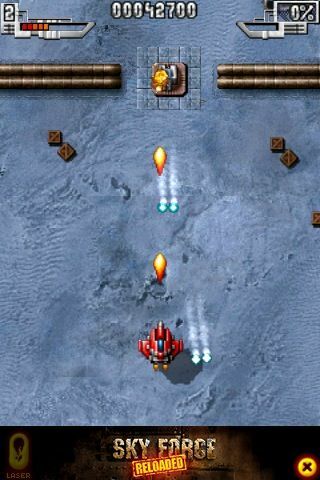 Sky Force Reloaded is a fun game for anyone. The graphics look good and the game is pretty nice. The range of difficulties and levels will keep you busy for hours. Sky Force Reloaded is $2.99 in the iTunes App Store.